Yesterday, I started deep-cleaning the studio and found six SEVEN square bandanas tucked into the couch, folded up in the upstairs built-ins, and randomly tossed into the supply closet. And that’s just at the studio – I honestly have no idea how many more I have at home. 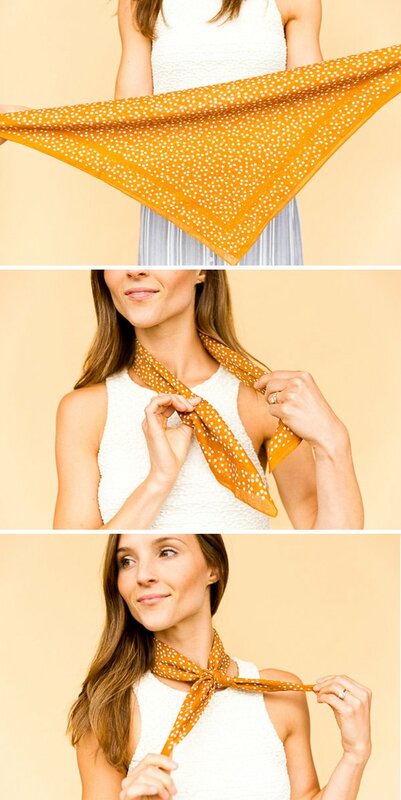 So, I came up with 5 quick tutorials for putting all of those rogue bandanas to good use for summer. Because let’s face it, we’ve all bought these little guys, but putting them to good use (and looking cute while doing it) is a whole other story. 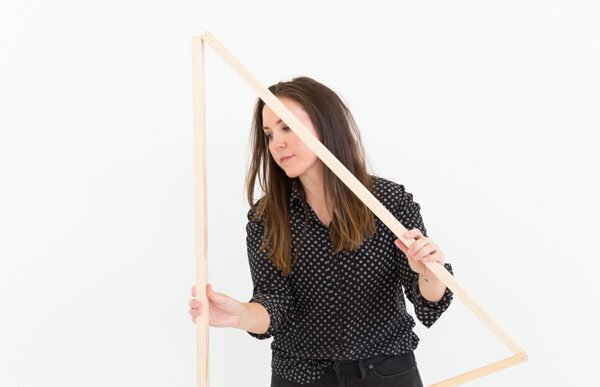 Click through for all 5 DIY looks and the step by step instructions for recreating them on your own, in 60 seconds or less. Who doesn’t love this casual / cool replacement for a necklace? To get this look, fold bandana in half at the points, to form a triangle. Then, roll (or fold) the long end of the bandana down toward the point. Wrap the rolled bandana around your neck and double knot – leaving the ends loose, as shown in the photo. 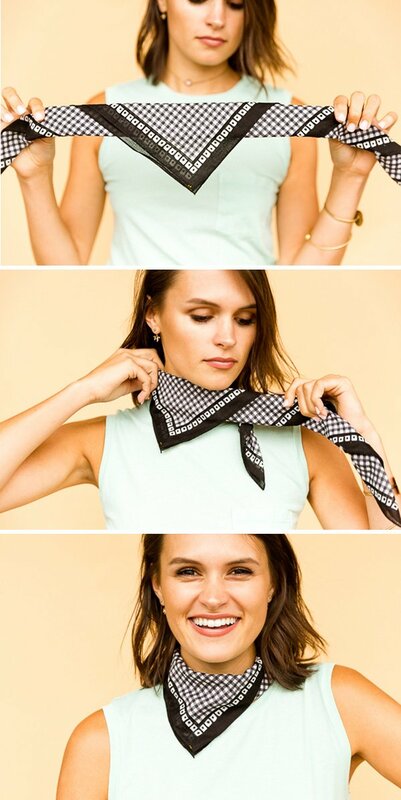 You can tie the knot tight to your neck or super loose, for a totally different look. For those times when you want to look like you tried, but also really just want to keep your hair our of your face. It’s kind of like the updated BFF of the scrunch, but much cooler. Fold bandana in half at the points, to form a triangle. Then, starting at the long end, fold the bandana down toward the point (a 2 inch fold is a good width for this one). 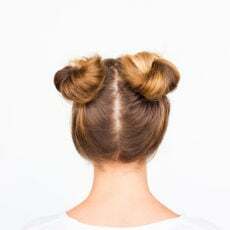 Once your hair is up in a ponytail, wrap the folded bandana around the ponytail base twice and then tie the ends in a knot. 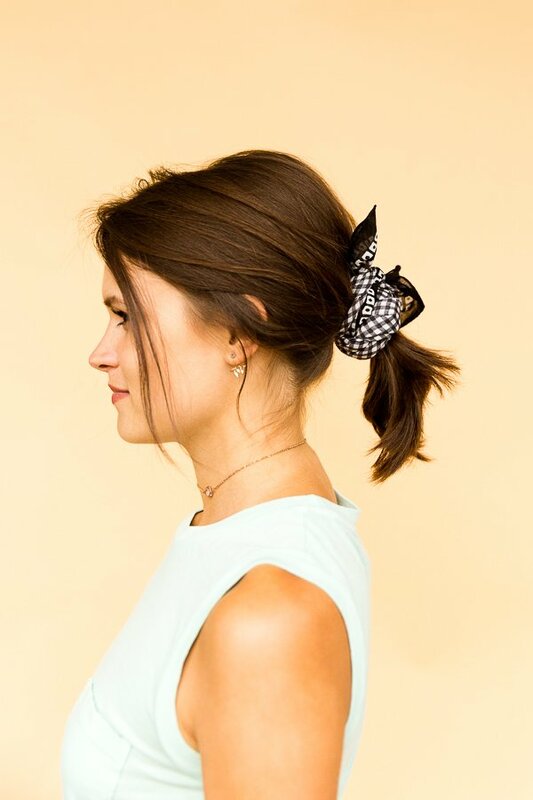 This tucked and knotted headband is simultaneously chic AF and super casual – one of my faves. Fold bandana in half at the points, to form a triangle. 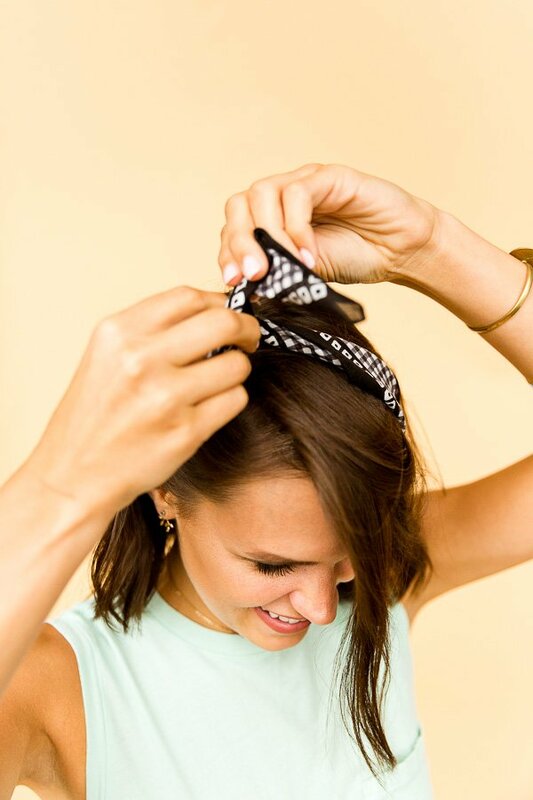 Then, starting at the long end, fold the bandana down toward the point (1-2 inch fold). 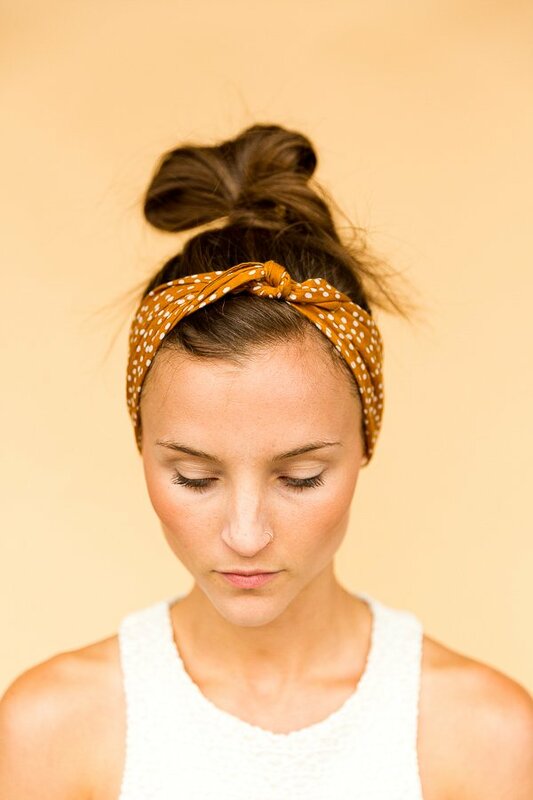 Once your hair is up in a ponytail or bun, wrap the folded bandana around your head and tie the ends in a secure knot. 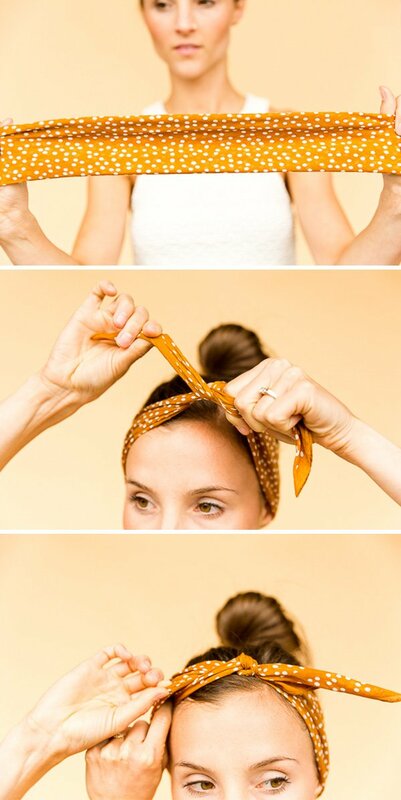 Then, tuck the loose ends underneath each side of the headband. Get your (mini) cowgirl on…or something like that…with a mini neck bib. Start with the same basic fold as the other tutorials. Fold bandana in half at the points, to form a triangle. Then, starting at the long end, fold the bandana down toward the point (1-2 inch folds) and leave the bottom point of the triangle out (unfolded) as shown in the photo. Wrap around your neck, with the triangle in the front and double knot the loose ends in the back. 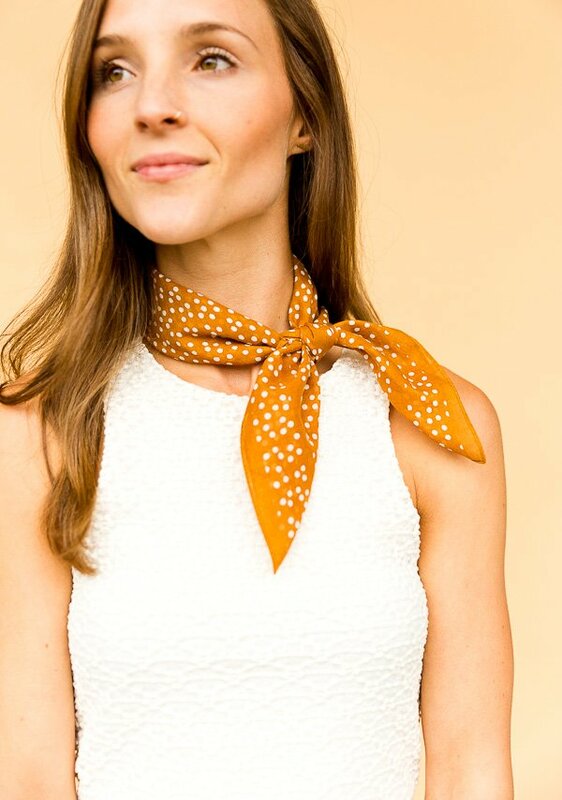 A more stylized take on the basic neckerchief. To get this look, fold bandana in half at the points, to form a triangle. Then, fold the long end of the bandana down toward the point (2-3 inch folds are a good width for this one). 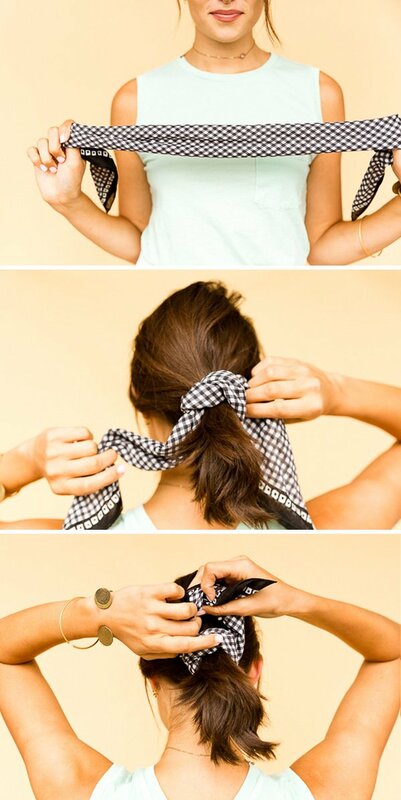 Wrap the folded bandana around your neck, then wrap it around again, and double knot it at the ends. Fold bandana in half at the points, to form a triangle. Then, starting at the long end, fold the bandana down toward the point (a 1-2 inch fold is a good width). When you get close to the end, tuck the point underneath the folds (as shown in photo), and then fold over one last time. 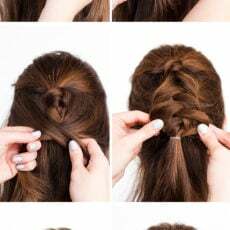 Wrap around your head, bring the two ends up to the top and tie in a double knot, leaving the ends loose to form a bow shape. This is a good one for any kind of hair – up or down, long or short, etc. P.S. 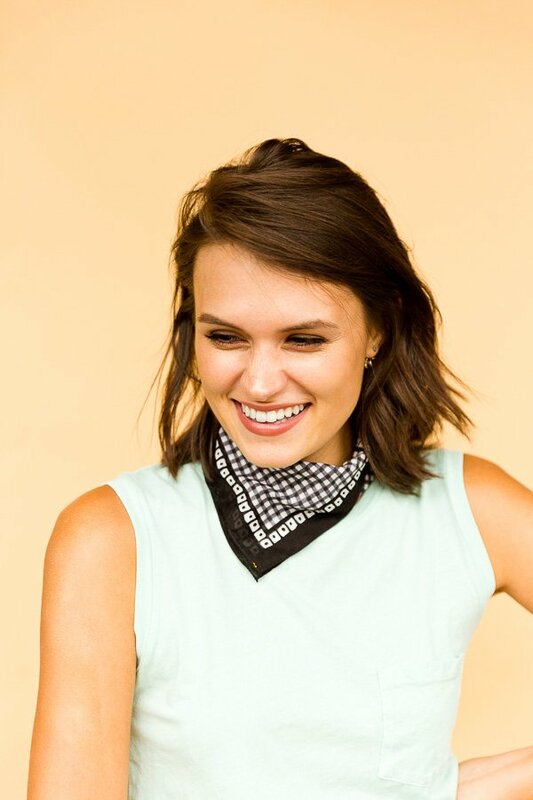 If you’re looking for an excuse to buy a new bandana to play around with these tutorials, I’m really loving this navy checkered one ($12.50) and this black and white one that’s similar to the one I used in some of the photos. Did I miss anything? 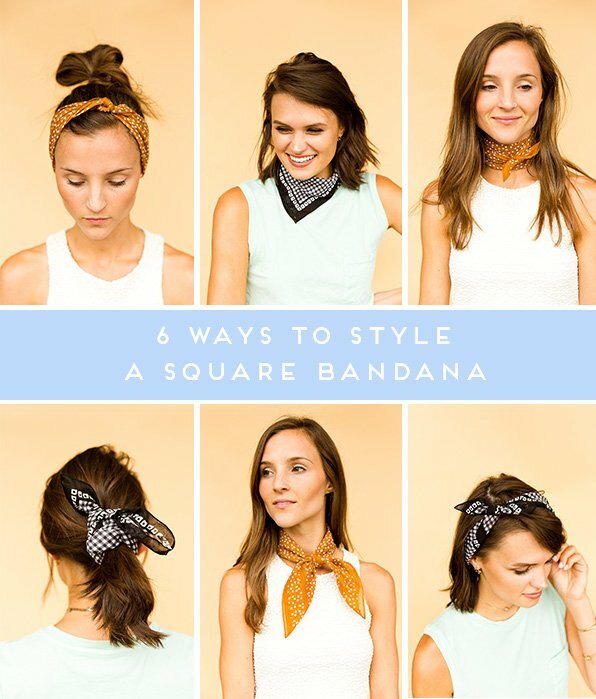 How do you like to style square bandanas with your outfits? Let me know in the comments below. These are all awesome tips! I totally need to up my bandana game! Thanks Paige. This was a fun one to put together. 🙂 We had more ideas too, butI’ll save those for another time. 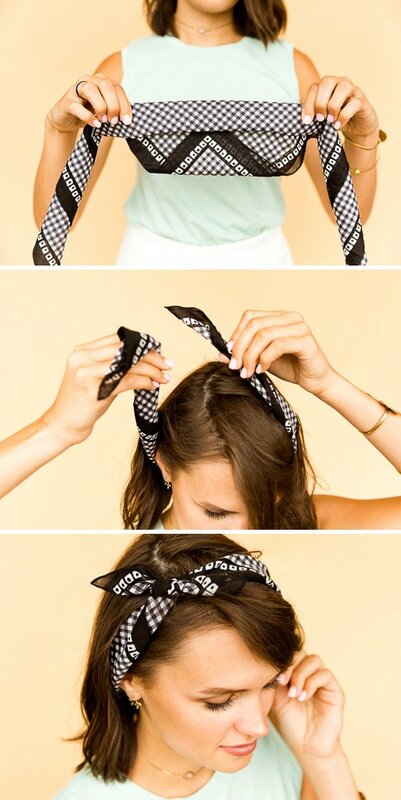 These are cool ways to style a bandanna. I like the neckerchief style the best. That’s amazing Natalie. I bet she has some good ones! Prints on vintage bandanas and scarfs are always the best! Lovely ideas, thanks for sharing! The ideas are great! I really love the bow headband style! I’ve always been a fan of wrapping my hair with some type of scarf or bandana for style. This gives me even more options. Thanks for sharing! Where did you get your bandana? I’ve been looking for a cute one like those but haven’t been able to find one. Love these ideas! Thanks for sharing! I was wondering where the orange polka dot bandana was from?